One of the things we so often hear from industry is the need for graduates to possess and demonstrate soft skills as they enter the workforce. Participation in SkillsUSA is one area in which students increase their application of soft skills. SkillsUSA enhances the lives and careers of students, instructors, and industry representatives as they strive to be champions at work. It empowers students to become world-class workers, leaders and responsible American citizens. SkillsUSA activities help students develop positive attitudes and build self-esteem. They give students a head start in developing valuable professional skills, such as communications, interpersonal abilities, time management, teamwork and more. SkillsUSA encourages students to take the skills they are learning at their school and challenges them to excel by entering any of the 100 Skills USA competitions starting at the regional and state level. Those who qualify by winning their competition field move on to state, national, and even international competitions. Students from each of the College’s Technology Programs have an opportunity to participate in the College’s SkillsUSA program and enter at least competency skill competition and apply their abilities against students from other colleges. In 2017, eleven TSCT students entered the Regional competition. Ten students competed at States. Five students competed at Nationals. 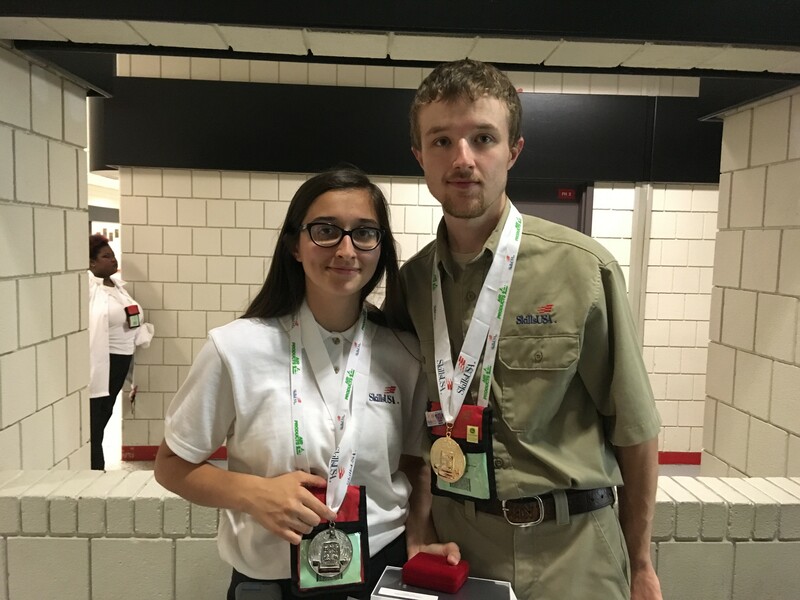 Matthew Wootten distinguished himself and Stevens College by winning a National Gold Medal in Cabinetmaking, and Cheyanne Kazmierski distinguished herself and the College by winning a National Silver Medal in Graphic Communications! In 2017-2018, we already have 22 students who are competing on the regional and state level in their selected competency field. All participating students have financial obligations required of the student, technical program, and the college in order for them to participate. All of these students are in need of funding support in order to participate in SkillsUSA this year. In order to provide financial support to participating students, the College has established a SkillsUSA Fund designed to offset student costs incurred to be a SkillsUSA member and participate in the annual SkillsUSA competitions on all levels. We have ascertained that the student cost averages $1,000 per student. For this amount of $1,000 annually, a company will be able to sponsor a student from a program of their choice, who is participating in a SkillsUSA competition. Additional students may also be sponsored. Should a company not want to directly underwrite a student sponsorship you may contribute directly to the Thaddeus Stevens SkillsUSA Fund, and those funds will be used to support unsponsored students. What are the sponsorship funds used for? Should you chose to sponsor a student(s) please complete and return the following “Company SkillsUSA Sponsorship Form” that is attached. Please send the completed form, along with your sponsorship check for $1,000 per student(s). Make the Check payable to: The Thaddeus Stevens Foundation and indicate whether it is to sponsor a specific student or technical program for 2017-2018 or just be used as an undesignated sponsorship for any participating student. Your sponsorship is tax deductible since it is being received through the Thaddeus Stevens Foundation, a 501 (C) 3 non-profit organization supporting the College. Your support will be acknowledged through the College‘s Communications and social media, The Annual report and other opportunities as appropriate and allowed by SkillsUSA. If you have questions related to this program please contact Allen Tate – 717-391-7285 or Deb Strubel 717-391-7294 in the College’s Advancement/Development Office. Below are twenty- two students who have already signed up for regional and state competition in 2017-2018 and are available for sponsorship. They are listed with the competition area they will be entering. Your support is appreciated.